Laparoscopic partial nephrectomy is an emerging minimally invasive nephron-spar-ing alternative to open partial nephrectomy. However, before laparoscopic partial nephrectomy can be recommended for widespread use, reproducible technical, perioperative, pathologic, functional, and oncologic outcomes comparable to open partial nephrectomy must be confirmed. Advances in laparoscopic skills and technology have allowed efficacious achievement of renal hilar vascular control, renal hypothermia (if required), tumor excision, calyceal suture repair, and hemostatic parenchymal suture repair. As such, current laparoscopic partial nephrectomy techniques duplicate the established principles of open nephron-sparing surgery (47). Since its development in a porcine model by McDougall et al. (48), several successful clinical experiences of laparoscopic partial nephrectomy have been reported. The first application of transperitoneal laparoscopic partial nephrectomy was reported by Winfield et al. (49) in a woman with a stone-bearing lower pole calyceal diverticulum. 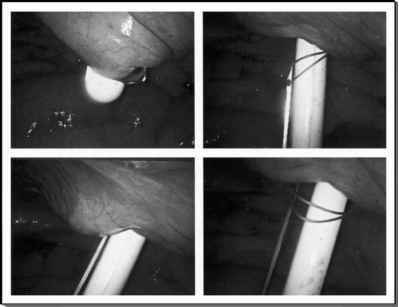 Retroperitoneoscopic partial nephrectomy was first described by Gill and coworkers (50). Depending upon the radiologic features and location of the individual tumor, laparoscopic partial nephrectomy may be performed by the transperitoneal or the retroperitoneal approach (51). Laparoscopic partial nephrectomy was initially limited to the treatment of select small, solitary, peripheral, superficial, exophytic tumor (49,50,52-56). With increasing experience, these indications have been carefully expanded to include patients with tumor infiltrating the parenchyma up to the collecting system or the renal sinus, completely intrarenal tumors, tumor abutting the renal hilum, tumor in a solitary kidney, large-size tumor requiring heminephrectomy, or a renal mass in the presence of concomitant renovascular disease (47,51,57). Morbid obesity and the presence of more than two renal tumors increase the technical difficulty of performing laparoscopic partial nephrectomy. Relative contraindications for laparoscopic partial nephrectomy include a central intrarenal located tumor, and prior open kidney surgery. Current contraindications for laparoscopic partial nephrectomy include the presence of a renal vein thrombus, and a locally advanced tumor. Patients with impaired coagulation, such as hemorrhagic diathesis, platelet dysfunction due to azotemia, or anticoagulant therapy must be approached cautiously with adequate medical preparation to minimize their hemorrhagic risk (58). Patients with atherosclerotic renovascular disease or those with status post-percutaneous renal artery stenting are at increased risk of intimal injury during renal artery clamping. Adequate laparoscopic experience is necessary before embarking on laparoscopic partial nephrectomy. A recent questionnaire-based survey assessed the current attitude of community urologists towards novel surgical options for renal cancers (59). An anonymous questionnaire was mailed to 174 members of the Minnesota Urological Society, with a response rate of 49%. Two clinical scenarios were proposed: (i) the case of a 6-cm lesion with no indication for nephron-sparing surgery, and (ii) the case of a 3-cm lower pole exophytic mass suitable for nephron-sparing surgery. In the first scenario, 14% of respondents would have offered laparoscopic surgery only, 43% open surgery only, and 43% either form of therapy. For the second scenario, 10% of responders would have offered minimally invasive treatment only, 55% open surgery only, and 35% either forms of therapy. In the latter scenario, laparoscopic partial nephrectomy would have been offered by 38% of respondents. The authors concluded that minimally invasive surgery for renal tumors is evolving into a standard of care, with a trend that is increasingly reaching the community urologist. Nevertheless, appropriately so, there remains a heavy reliance on referrals to select tertiary-referral centers with extensive laparoscopic experience.